Magnets are printed on extra thick, satin-luster cardstock, which beautifully enhances photos and artwork. (Magnet thickness is 32 points.) You can easily edit colors, fonts, and wording using the online design tool, and it only takes minutes to create a unique design. Quick processing & shipping and they turned out amazing! Great ProductExcellent quality and fast delivery - We love our magnet and have gotten a lot of compliments on it already. Would definitely order from this company again. Fast shipping and excellent quality! 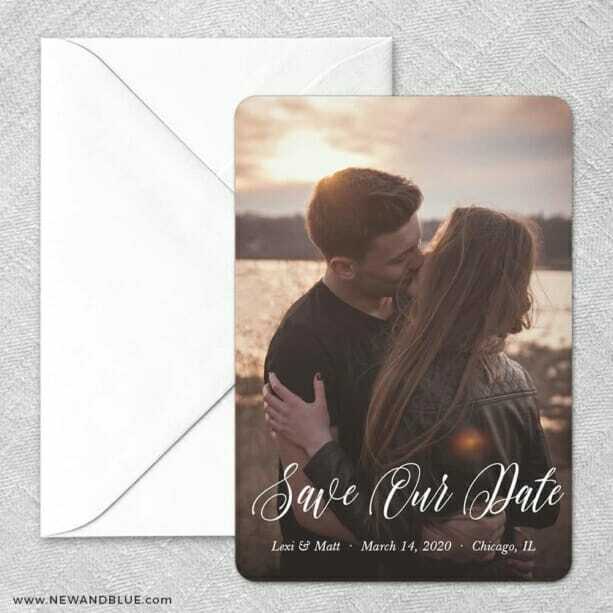 I was very happy with how my save the date magnets turned out! I ordered samples from many different websites and I have to say New and Blue had the best quality magnet. The picture came out very clear! Fast delivery plus amazing results equals happy and very satisfied costumer. Thank you!! !